Product #5802 | SKU 3138X00090 | 0.0 (no ratings yet) Thanks for your rating! 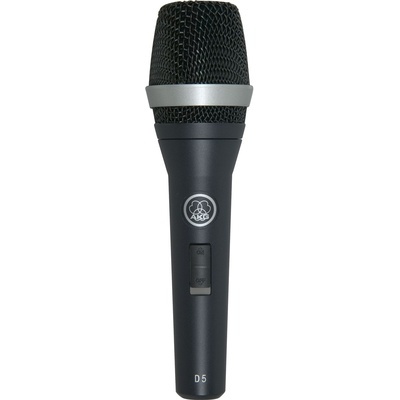 The AKG D5 is a supercardioid, handheld dynamic microphone designed to accurately capture vocals during performances. The supercardioid polar pattern is most effective at eliminating off-axis noise and feedback. The capsule features a dual shockmount for enhanced protection against handling noise. The D5 is a rugged handheld microphone with the sonic characteristics necessary to cut through loud stage performances. An on/off switch is provided for added control. The supercardioid polar pattern provides a focused pickup pattern for enhanced feedback and noise suppression. The rugged D5 features a dual shockmount capsule for enhanced protection against handling noise. Patented AKG Laminated Varimotion Diaphragm accurately reproduces vocals.